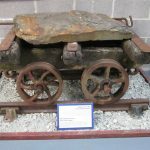 A typical 3 bar slab waggon as found in nearly all of the quarries the Ffestiniog area. 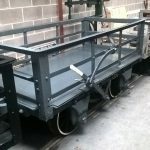 This is an internal user waggon, in this case to carry slabs from the rockface to the mill for reduction into roofing slates. Note the double flanged wheels, loose on their axles which allowed for any variation in gauge on the poorly laid quarry trackwork. 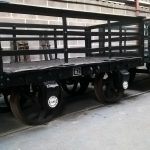 This waggon is sitting on Dinorwic Quarry Bullhead rail and chairs. Built at Boston Lodge for Curtis & Harvey gunpowder suppliers in the 1880s. It was originally internally lined in pine and had wooden brake blocks to prevent any sparks whilst in transit. It was used to carry gunpowder and fuses from the harbour at Portmadog up to and into the Quarry. 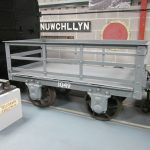 The van was donated by the quarry to the Bala Lake Railway for use as a tool van when the line was being laid. No. 82 built in 1885 in a batch of 100 un braked waggons, these waggons were built because the Ffestiniog Railway objected to its own waggons being used to carry slate which was not travelling over its own railway. The LNWR wanted a share of the slate being produced in Blaenau to leave over the LNWR network. These waggons were mostly used by the Oakeley and Llechwedd Quarries. This example was used at Llechwedd. The waggons were loaded onto standard gauge transporter waggons and sent to Deganury. No. 18 built in 1899 at Swindow works of the GWR. 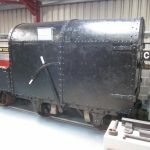 It was built to carry finished slate from Craig Ddu quarry at Manod down the inclines where the wagons were loaded onto standard gauge transporter waggons which were taken to Blaneau Ffestiniog’s Great Western station for transshipment to conventional standard gauge waggons. This arrangement occurred after the GWR took over the Festiniog and Blaneau railway and converted it to standard gauge. This example was one of the first batch of 50 to be delivered. 1049 was one of a batch of 33 of this configuration built circa 1895 at the Ffestiniog Railway’s Boston Lodge Works and was one of the last slate wagons built to run from Blaenau Ffestiniog to Porthmadog.